Unlike other Disney Parks, Hong Kong Disneyland takes a unique approach on their Halloween events by striving for an older crowd who is willing to get scared. This year is no different. Under host, Maleficient, Main Street is haunted by masses of zombies wandering mindlessly. In the center of the hub, is Maleficient in her dragon form; an ominous sight against the Sleeping Beauty Castle back drop. As night falls, this year introduces Nightmare in the Sky, a pyrotechnic spectacular featuring world class projections, fire effects, fireworks, and even an apperance by Maleficent herself. The 10 minutes spectacular occurs each night during Haunted Halloween running now through October 31st. Returning classics also take over the park. Glow in the Park parade will once again run down the parade route. Main Street Haunted Hotel will opens its doors to guests, along with Demon Jungle, the paranormal forest. Adventureland spirits come to life at Tribal Burrial Ground, and those brave enough can try their hand at Space Mountain Ghost Galaxy, a haunting twist on the Disney park staple. Also new for this year, is the Inferno Dance Party. Hong Kong Disneyland continues to be one of the leading innovators for holidays at Disney Parks. We have already seen some concepts applied into other Disney Parks such as Ghost Galaxy’s debut at Disneyland in California 2009. 2011 will be a big year with lots of exciting new additions. The park just announced the addition of Mach Tower, a 245 foot free fall tower, a completely redone Oktoberfest area, and Water Country will soon be home Vanishing Point, a 75 foot tall slide tower. Along with this, the park also released info about what the park has in store for the 2012 year. The biggest addition for 2011 will be Mäch Tower. Reaching a height of 246 feet, and speeds of 60 mph the new addition will be part of an refurbished Oktoberfest. A drop tower has been long rumored for Busch Gardens Williamsburg. This announcement may come as no surprise to many. 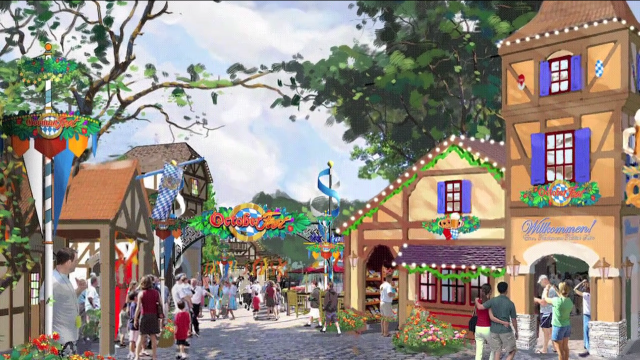 However, the real suprise may be the announcement of refurbishment of Oktoberfest. The park will be giving the 30 year old section of the park a complete refurbishment. 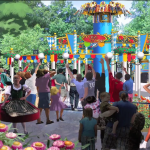 These new additions will make Oktoberfest a much improved area in the park. Opening in 2011 at Water Country USA is Vanishing Point. 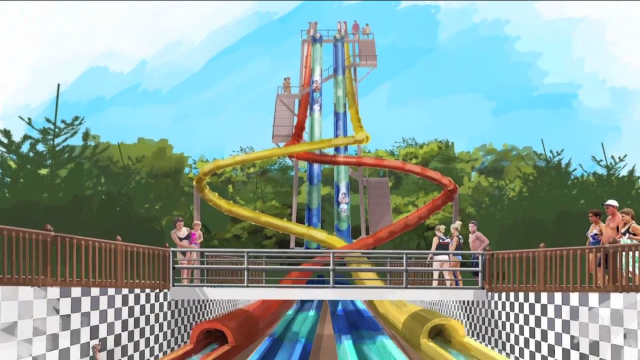 Water Country USA will be adding Vanishing Point, a new 4-slide, slide tower that rises 75 feet off the ground. Busch Gardens describes the ride as being “pure liquid-adrenaline”. Two of the slides will feature a box type compartment where guests step into before the floor being dropped out beneath them plummeting them through the twists of tubes before ending in the splash pool. The other two however will be speed slides with a traditional drop but very high off of the ground. Vanishing Point will be unique to Water Country USA and opens in 2011. Perhaps the biggest announcement was the addition of a Multi-Launch coaster for 2012 that will feature many “firsts”. The coaster sounds similar, if not identical to Busch Gardens Tampa Bay’s new roller coaster. No details have been released on the coaster yet. To see the official Busch Gardens Williamsburg announcement web page, click here. The announcement video has been embedded below as well. Busch Gardens Williamsburg has a bright future that makes the park look better and better ever year. Congratulations to the park for winning ‘Most Beautiful Park’ for the 20th year in a row. Check back for more updates about Busch Gardens Williamsburg, we’ll keep you posted.